The open architecture of Boost My Shop Connect allows for a fully functional fluid and optimised solution necessary for your activity. The numerous native intégrations of Connect will allow for an immediate and instantaneous compatibility with your CRM, your accounting solution or even your PIM. 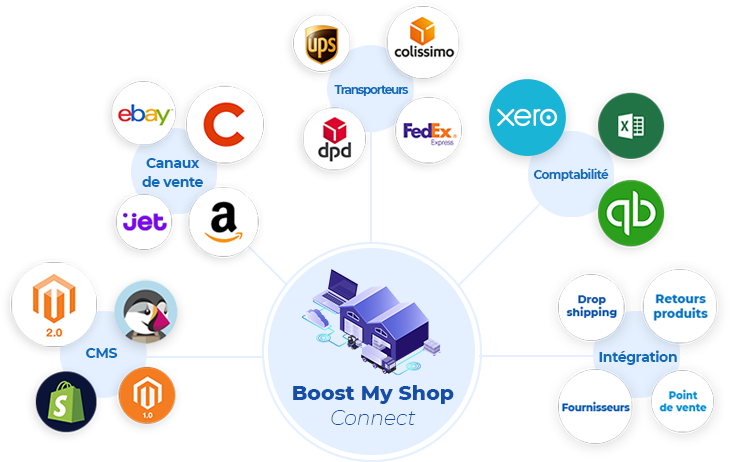 With Boost My Shop Connect you are implementing an essential solution which allows for perfect synchronisation and full compatibility of the entirety of your tools. Simplify your accounting with accounting exports (Q2 2019) integrated in Connect ! The order is ready? With connect, it will automatically be sent with Ship Theory ! Share and follow us !